Canton Games Advent Calendar Day 6: Dominion Bundle! Looking for the best new game to have come out since Puerto Rico? Want to get all the expansions at once and save a big pile of money while you do it? 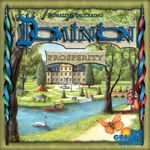 We’ve got the base Dominion plus Intrigue, Seaside AND Prosperity, all for $135. That deal is crazy-go-nuts. Pick it up for a friend, I won’t tell if you keep some of the expansions for yourself. This entry was posted on Monday, December 6th, 2010 at 12:32 PM and is filed under Uncategorized. You can follow any responses to this entry through the RSS 2.0 feed. Both comments and pings are currently closed.